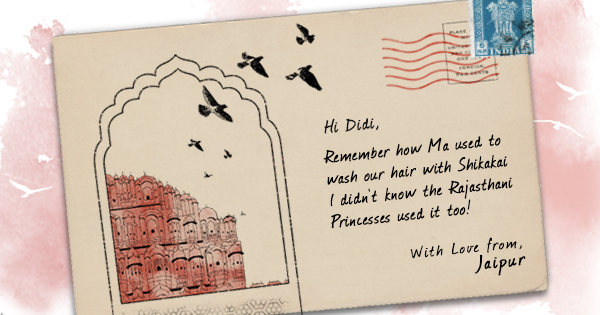 Postcards on hair from across the country. The weather in Jaipur is so hot and dry. You know how what that does to my hair! It was so unmanageable yesterday, and I was complaining about it to the local guide. He gave me a box of shikakai powder, and said that everyone from his wife to the Princesses of Jaipur use it to get rid of all the sand that finds its way to hair! Remember when we were kids - Ma used to wash our hair with it! Who knew it’s a miracle-worker here, right? So, apparently it takes away all the dust in your hair, but doesn’t strip it off the oil. Actually, after I used it, I was a little worried, because it felt a little coarse at first, I couldn’t even run a comb through it! But now, the dryness is gone and it is so soft and bouncy. We should go back to using this! How are things in the city? Give Ma my love. If you liked the recipe as much as you did the postcard, drop us a line at secrets@hairsutras.com and we'll send you the details!